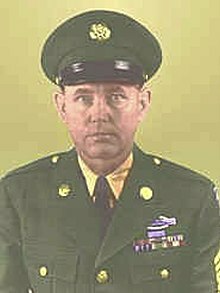 William John "Bill" Crawford (May 19, 1918 – March 15, 2000) was a United States Army soldier who received the Medal of Honor for his actions during World War II. He was also a career U.S. Army enlisted soldier and later a janitor at the United States Air Force Academy. Crawford was born on May 19, 1918, in Pueblo, Colorado, and later joined the U.S. Army from that city in July 1942. By September 13, 1943, he was serving as a private with the 142nd Infantry Regiment 36th Infantry Division in southern Italy. On that day, he was acting as a squad scout when his company attacked Hill 424 near Altavilla Silentina. During the battle, Crawford twice moved forward through continuous fire and, using hand grenades and his rifle, destroyed machine gun nests which were holding back his platoon's advance. After the battle, Crawford was captured by the Germans and presumed dead. So in 1944 the Medal of Honor was presented posthumously to his father. Later in the year, Crawford was among a group of soldiers rescued from German captivity. On January 13, 1946, he married Eileen Bruce. He re-enlisted in the Army in 1947, retired in 1967 with the rank of master sergeant. He later worked as a janitor at the United States Air Force Academy in Colorado Springs and as director of the Lucretia Vaille Museum in Palmer Lake. While working at the Air Force Academy, he mentioned to friends that he had never received the Medal from the president. In 1984, during that year's graduation ceremony, President Ronald Reagan formally presented him with the Medal. Crawford died at age 81 on March 15, 2000, in his residence at Palmer Lake. Upon his death Governor Bill Owens authorized all Colorado flags to be lowered to half staff in his honor. He is buried at the United States Air Force Academy Cemetery in Colorado Springs. He is the only US Army enlisted person buried there. He is one of four Medal of Honor recipients from Pueblo, Colorado, the others being Drew Dennis Dix, Raymond G. Murphy, and Carl L. Sitter. A bronze statue of Crawford resides at Hero Plaza at the Pueblo Convention Center with the other three Pueblo Medal of Honor statues. The Crawford House in Colorado Springs was named in his honor. 36th Infantry Division shoulder patch. For conspicuous gallantry and intrepidity at risk of life above and beyond the call of duty in action with the enemy near Altavilla, Italy, 13 September 1943. When Company I attacked an enemy-held position on Hill 424, the 3rd Platoon, in which Pvt. Crawford was a squad scout, attacked as base platoon for the company. After reaching the crest of the hill, the platoon was pinned down by intense enemy machine-gun and small-arms fire. Locating 1 of these guns, which was dug in on a terrace on his immediate front, Pvt. Crawford, without orders and on his own initiative, moved over the hill under enemy fire to a point within a few yards of the gun emplacement and single-handedly destroyed the machine-gun and killed 3 of the crew with a hand grenade, thus enabling his platoon to continue its advance. When the platoon, after reaching the crest, was once more delayed by enemy fire, Pvt. Crawford again, in the face of intense fire, advanced directly to the front midway between 2 hostile machine-gun nests located on a higher terrace and emplaced in a small ravine. Moving first to the left, with a hand grenade he destroyed 1 gun emplacement and killed the crew; he then worked his way, under continuous fire, to the other and with 1 grenade and the use of his rifle, killed 1 enemy and forced the remainder to flee. Seizing the enemy machine gun, he fired on the withdrawing Germans and facilitated his company's advance. After retiring from the military, Crawford procured a job working as a janitor at the U.S. Air Force Academy. He was not openly eulogized by any of the cadets and staff because he was humble and liked to keep anonymous. "Mr. Crawford" was described as "an unimpressive figure, one you could easily overlook during a hectic day at the U.S. Air Force Academy." Crawford being shy and unassuming did his work well and "blended into the woodwork and became just another fixture around the squadron." Cadet James Moschgat "was reading a book about World War II and the tough Allied ground campaign in Italy," when he read an incredible story of a private William Crawford who was presumed killed in action and whose father received the Medal of Honor for his son. Unknown to the Army and his family, Crawford had been captured by German soldiers and held as a prisoner of war for nineteen months until the war ended. In that book was a picture of a man who resembled his squadron janitor. Moschgat shared this with the other cadets and confirmed the story with Mr. Crawford who replied similar to "Yep, that's me." When asked why he did not talk about it, Crawford said, "That was one day in my life and it happened a long time ago." The word spread with new formed respect for Mr. Crawford. In time, Crawford told his story and things he had learned in life to each academy class. His example also taught them many lessons. These sometimes subtle lessons became of great importance to many of the cadets. Here was a man presumed dead, whose father had received the Medal of Honor for his son from an Army general, then who returned with honor and continued to serve his country and later served them. Bill Crawford, our janitor, taught me many valuable, unforgettable leadership lessons. Here are ten I'd like to share with you. 1. Be Cautious of Labels. Labels you place on people may define your relationship to them and bound their potential. Sadly, and for a long time, we labeled Bill as just a janitor, but he was so much more. Therefore, be cautious of a leader who callously says, "Hey, he's just an Airman". Likewise, don't tolerate the O-1, who says, "I can't do that, I'm just a lieutenant. 5. Anyone Can Be a Hero. Mr. Crawford certainly didn't fit anyone's standard definition of a hero. Moreover, he was a private on the day he won his Medal. Don't sell your people short, for any one of them may be the hero who rises to the occasion when duty calls. On the other hand, it's easy to turn to your proven performers when the chips are down, but don't ignore the rest of the team. Today's rookie could and should be tomorrow's superstar. 6. Leaders Should Be Humble. Most modern day heroes and some leaders are anything but humble, especially if you calibrate your hero meter on today's athletic fields. End zone celebrations and self-aggrandizement are what we've come to expect from sports greats. Not Mr. Crawford-he was too busy working to celebrate his past heroics. Leaders would be well-served to do the same. 7. Life Won't Always Hand You What You Think You Deserve. We in the military work hard and, dang it, we deserve recognition, right? However, sometimes you just have to persevere, even when accolades don't come your way. Perhaps you weren't nominated for junior officer or airman of the quarter as you thought you should; don't let that stop you. 8. Don't pursue glory; pursue excellence. Private Bill Crawford didn't pursue glory; he did his duty and then swept floors for a living. 9. No job is beneath a Leader. If Bill Crawford, a Medal of Honor winner, could clean latrines and smile, is there a job beneath your dignity? Think about it. Pursue Excellence. No matter what task life hands you, do it well. Dr. Martin Luther King said, "If life makes you a street sweeper, be the best street sweeper you can be." Mr. Crawford modeled that philosophy and helped make our dormitory area a home. Home of Heroes – William J. Crawford – includes older image. ^ a b "Medal of Honor recipients – World War II (A–F)". Medal of Honor citations. United States Army Center of Military History. May 11, 2010. Retrieved August 30, 2010. ^ Roper, Peter (August 30, 2010). "State Fair salutes soldiers and airmen". The Pueblo Chieftain. Pueblo, Colorado. Archived from the original on August 30, 2010. ^ Pueblo Medal of Honor Foundation (2004). "Pueblo Medal of Honor Memorial at Pueblo Convention Center". Hero Plaza. Pueblo Medal of Honor Foundation. Retrieved October 18, 2012. ^ a b c d Colonel James E. Moschgat, USAF (Ret.) (2010). "Leadership and the Janitor". On Patrol – The magazine of the USO. USO. Retrieved October 18, 2012. "Medal of Honor recipients". Medal of Honor citations. United States Army Center of Military History. August 3, 2009. Retrieved July 1, 2010. "Texas Military Forces museum". Retrieved October 5, 2010. "Palmer Lake Historical Society". Retrieved October 5, 2010. "Pueblo MOH Foundation". Retrieved October 5, 2010. "Funeral for William Crawford". The Gazette. March 21, 2000. "Crawford House marks 5 years of helping struggling veterans". The Gazette. May 12, 2006. Warmbrunn, Susan (September 22, 2000). "Honoring heroes/ Medal of Honor group feted in Pueblo". The Gazette. "Obituary". The Gazette. March 19, 2000. "William J. Crawford". Claim to Fame: Medal of Honor recipients. Find a Grave. Retrieved October 24, 2007. "A Janitor's 10 Lessons in Leadership". Retrieved October 5, 2010. This page was last edited on 6 March 2019, at 18:43 (UTC).